Adding help system can significantly improve the use of your applications. It helps users understand how to use a specific feature or accomplish something with the program, reducing the effort spent on support. Creating a help system requires a significant effort. You will have to write texts explaining the working of the program and set up navigation using links, table of contents, index and search to enable your users to find the relevant content. Also, you need to integrate the help with your program, using F1 or a Help button. 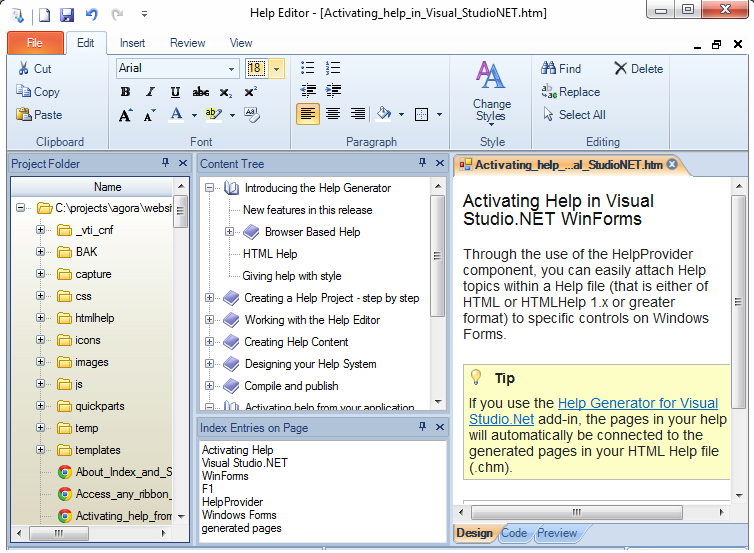 The Help Editor has many features which simplify and increase the productivity of the help authoring process - as is shown in this article. All Help Editor actions are available from the ribbon. If you have experience with recent Office versions you should feel at home immediately. When you create a new help page, you can select from available templates to have automatically parts included in the page, such as the title or breadcrumb. Adding text links to other pages can be done by simply dragging pages from the project explorer or content tree. The software automatically sets the URL text to the title of the page being linked to. A prefab set of 'quick parts' lets you easily insert styled text parts, such as a Tip or Warning. The styling obviously can be easily changed by altering the default style.css. If you want to create a descriptive page for a form you should use 'Generate Document' on the 'Insert' tab. After minimizing the Help Editor you can now select the form. After pressing the 'PrtScn' key a page is generated showing a screenshot and including sections for each control on the form. In each section you then add explanatory text. The fastest way to document your application. You can add pages to the table of contents by dragging them from the project folder. Again, the software automatically sets the TOC node text to the title of the page added. To reorganize the table of contents just drag and drop pages to their new position. The index is the most often used approach to finding information. The Help Editor makes it very easy to manage the index. An 'Index Entries on Page' pane shows the keywords and phrases that point the user to the page currently having focus. It is sufficient to drag text from your page onto the pane. You can edit and reorganize entries in the pane freely in the pane. On exit, the content of the pane is reinterpreted and the index updated automatically. An important step before publishing the help is to review the links. In the Review tab, pressing 'Broken Links' will scan text links, index and table of contents. Broken links are reported and can directly be fixed. At any time you can compile your help to both CHM help and browser based help from Backstage (the File tab). You will notice our implementation optimally uses the power of the help viewer, including a rich set of features, such as Favorites, Print page, Show/Hide navigation pane, navigation buttons and more. Both HTML Help and Web Help systems can be integrated with your application. On the Help Editor website and in the product's help file you will find resources explaining how to provide context-sensitive Help for applications written in different programming languages manually and how to integrate a Web Help system with your desktop or web application. For Visual Studio, Classic VB and Microsoft Access add-ins are available which generate help directly integrated with your application. A time-saving jumpstart for your help and documentation development. You have seen how Help Editor can help you with your help authoring-related tasks. As a help authoring tool for quickly creating high-quality help files and manuals, it allows you to create a help project without the need to master technical details. In fact, you even do not have to know anything about HTML or CSS to create professional help systems. The Help Editor is a really productive help authoring tool that will save you time and money as a result. If you want to try the Help Editor you can download it from our website as a FREE 30-day evaluation version. You can download, install, and try out the full product.